A quick, low-cost solution for your display and signage needs! Inkjet printable magnetic sheeting can easily be used with most inkjet printers and plotters to produce magnetic graphics for P.O.P. displays, posters, display boards and many other indoor images. Printed material lays flat and can be attached to most metal surfaces, or use it with FlexIRONT magnetically receptive material. This high quality, matte finish paper is backed with flexible magnetic material that cuts easily with scissors or knife. Available in 8.5" x 11" sheets of regular or perforated for business cards, or in large format rolls with 24.375" width! NEW! Also available in 4" x 6" photo-quality sheets with glossy finish! Works with personal inkjet photo printers. WARNING: Do not place magnetic media, (floppy disks, audio, cassette tapes) on top of or in contact with the magnetic sheets. PrintMagnetT sheets do not appear to have any harmful effects on monitors, hard drives or printer electronics. Writing on printed magnetic paper may cause the printed image to smear. Avoid exposing PrintMagnetT to moisture and direct sunlight. The chart below lists the types of known printers that work with PrintMagnetT. Most inkjet printer models manufactured after 1999 appear to work with PrintMagnetT. Master Magnetics, Inc. is not responsible for damage caused by improper product use. Many word processing/desktop publishing programs have templates for various document sizes and layouts. 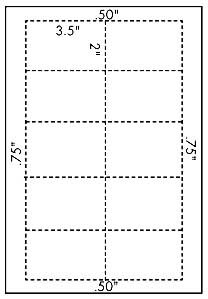 Look for a template for standard size business cards (ten 3.5" x 2" cards on an 8.5" x 11" sheet) with .75" right/left margins and .5" top/bottom margins. CAUTION: PrintMagnetT Business Cards may not work with every printer listed above. Printers that work best keep the paper flat or nearly flat during the entire printing process. If the printer pulls the paper from the front and wraps it around a roller before printing, PrintMagnetT Business Cards may not work because the cards can separate and jam the printer. Standard PrintMagnetT, however, will work with this type of printer.